I saw some bizarre things this morning. I saw five helicopters hovering over downtown Manhattan. I saw Zuccotti Park completely barricaded by the NYPD save for two small entrances on either side. I saw cops exercising compassion and empathy, and others exercising aggression and anger. I saw a man in the throes of a seizure, his body convulsing with arms flung straight out, wrists and fingers bent at extreme angles. 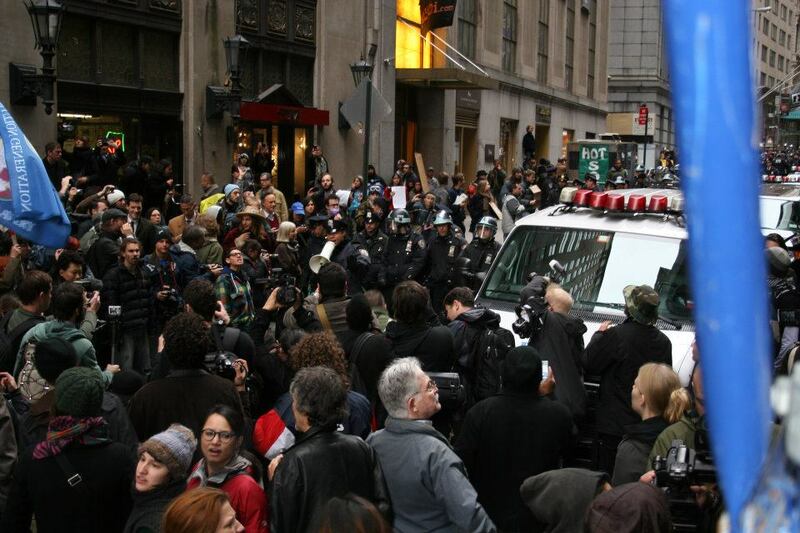 The police dispersed protestors from Wall Street on Nov. 17. On Wall Street protestors linked arms and formed a human barricade. Not to avoid being arrested, but in an effort to physically shut the street down by not allowing pedestrians to pass through. One pedestrian laughed as he tussled with protestors. After getting through he walked back around the barricade and taunted those who were being roughed up by the police. Another Wall Streeter saw a human barricade being formed in front of him and immediately went ballistic. The well-dressed young man screamed “you cannot be serious!” and started pushing and punching his way through the line. As for civil disobedience impeding commerce, many of the Civil Rights Movements’ most successful operations involved “impeding commerce.” The marches and sit-ins hurt local businesses and the major ones caused economic hiccups in the largest cities. I challenge the notion that this is a bad thing. Not only does civil disobedience need to impede commerce, it needs to impede every aspect of normal life. The 99 percent are in this together, whether you identify with them or not. The discomfort they inflict on their peers isn’t done in a spirit of malice, but rather as a way to make those who are not engaged stop and think about how they’re affected by conditions beyond their control. Although there were at least two hundred arrests, the NYPD seemed more prepared this time around. Occasionally I picked out a cop who I could tell genuinely enjoyed violently imposing his will on people. On the other side of that coin were the few protestors that instigated cops and came looking for a fight. Troublemakers aside, the NYPD seemed calmer than they did on the Sept. 24 march to Union Square. There were certainly tense moments when fear rippled through the crowd as people were thrown against each other and wild-eyed cops advanced. But in my opinion, the police did a better job of controlling and dispersing the crowd when it was time. The truth is that Occupy Wall Street needs the police. Without an authority figure to rail against the movement would have lost its steam long ago. Public sympathy wouldn’t be nearly as strong if videos of police beating protestors didn’t get out. That’s not to say the NYPD could solve their problem by ignoring it, but rather that the protest owes much of its clout to the very actions they decry when engaging in marches and civil disobedience. If the police can handle the protestors without fracturing skulls, and the occupy movement can live on through the publicity generated by a few bruises and a couple hundred arrests, it’s a win for the 99 percent. 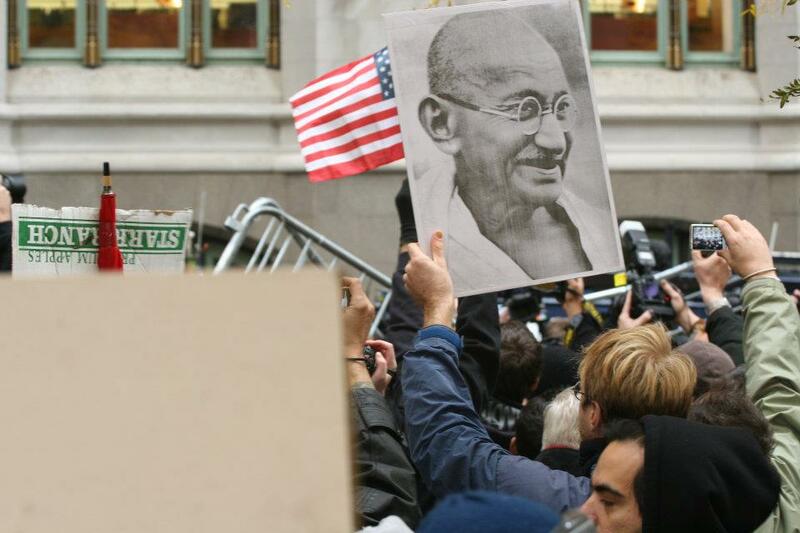 To view footage taken from the Nov. 17 March to the NYSE, click here. Back at Zuccotti Park police clashed with protestors after they began removing the barricades surrounding the park. This entry was posted in Commentary, Misc., News. Bookmark the permalink.